The Russo Brothers are currently handling reshoots for Avengers 4 in Atlanta and the cast has been spotted in some leaked photos from the set. However, now that the cat's out of the bag, the cast has gotten in on the fun and are sharing some pictures of their own. Jeremy Renner has been teasing Marvel Cinematic Universe fans of his return for months, but recently showed off his Hawkeye haircut on social media. Nebula actress Karen Gillan just shared a screenshot of her alarm clock, preparing to go through the grueling makeup process. Now, Chris Evans and Gwyneth Paltrow are the latest Avengers 4 stars to share pictures from the set. 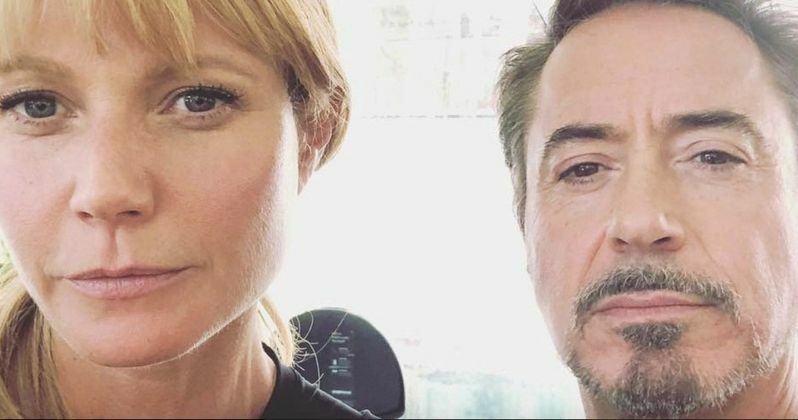 Gwyneth Paltrow posted a picture of herself as Pepper Potts and Robert Downey Jr. as Tony Stark, teasing the reunion that fans have been waiting for. Paltrow already revealed that they will be married and have a child, so things are going to be radically different for Tony Stark in Avengers 4. The actress took the picture while the two were eating lunch on the set and captioned it with the hashtag "pepperony." Chris Evans was one of the first actors to be spotted on the set of Avengers 4 for reshoots, along with Paul Rudd and Scarlett Johansson. Since then, the actor has posted a video of his dog Dodger singing at a local dog park with another dog and a new picture of himself, looking very much like the clean cut Steve Rogers from previous Captain America and Avengers films. Dodger has become a bit of a celebrity in his own right, but MCU fans are still trying to figure out why Rogers will have the clean shaven look this time around. Fan theories of time travel and the use of the Quantum Realm have all been brought up numerous times before, which have been fueled by set images from principal photography. We have seen an older Tony Stark interacting with Steve Rogers in his old Captain America costume from the first Avengers movie and Mark Ruffalo in a Hulk motion capturing suit during the Battle of New York City. Also present in the leaked photos is Paul Rudd's Scott Lang, who was not present during the epic battle. Infinity War and Avengers 4 screenwriters Stephen McFeely and Christopher Markus have said in the past that MCU fans are going to be shocked and surprised by what they see on the big screen, while also declaring that nobody will be able to guess what happens in the film. The Russo Brothers have echoed this sentiment as well, which has only dumped fuel on the speculation fires that are currently burning. While there's only a few people who know what's really going on, it looks like the cast are enjoying themselves in the process of keeping this massive secret. You can look at the new Avengers 4 set photos below, thanks to Gwyneth Paltrow's Instagram page.